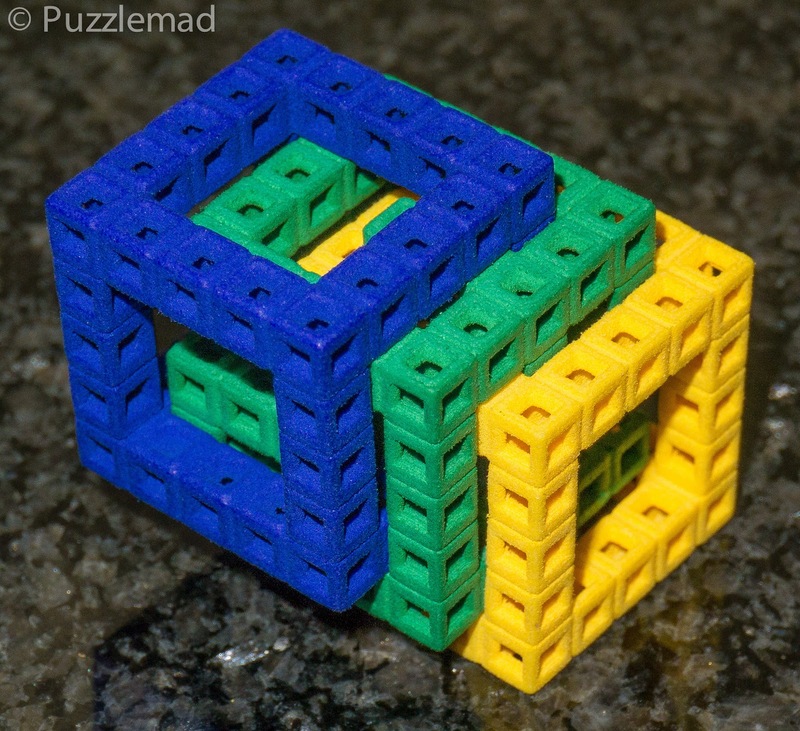 PuzzleMad: It's Not So Hard! Just Look and Think! 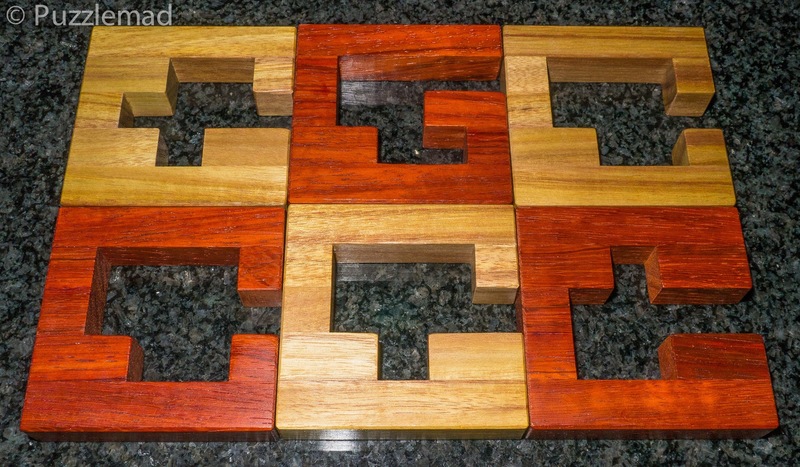 I started out with the intention to just write a short review of a cheaper puzzle today as it would appear that recently I have tended to focus on the more bespoke, craftsman made puzzles. This would also fit in with the present Mrs S being a bit fed up with all the time I spend on-line on a Sunday writing these posts. She plans to visit the outlaws for a pre-Xmas visit this week and it has sort of become a tradition that she arrives with some food made by me. My father-in-law is quite partial to my leek and potato soup and so yesterday I was informed that today (Sunday), I was going to make a large pot of soup so that a good sized portion could be transported to Edinburgh for them. The stock pot is 11L in volume and preparing everything and cooking such a huge amount of soup usually takes me quite a few hours. I therefore needed something quick to write about. 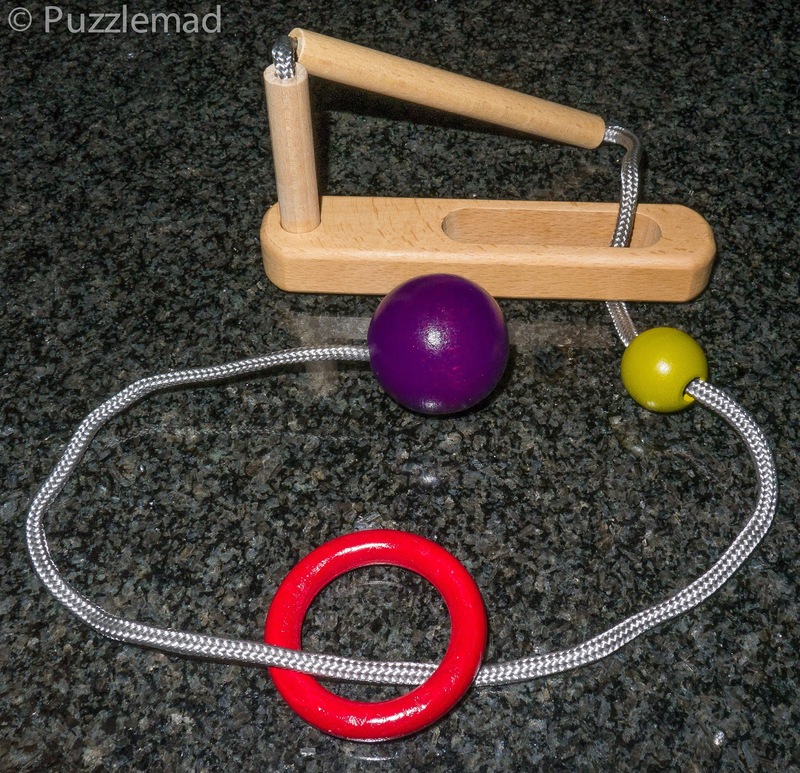 With these time limits in mind, I rummaged in my "puzzles to be solved" pile yesterday and took out the Max Out disentanglement puzzle from Eureka puzzles' Pastime range. I had been hoping for something fairly easy to solve that would not take too long but I seem to have run out of those. I had bought this from Tomas Linden's Sloyd store some time ago and was a little concerned that the rating on the packaging was 4 stars indicating that the puzzle was for "puzzle geniuses" and that Tomas had rated it with his maximum of "Very hard". 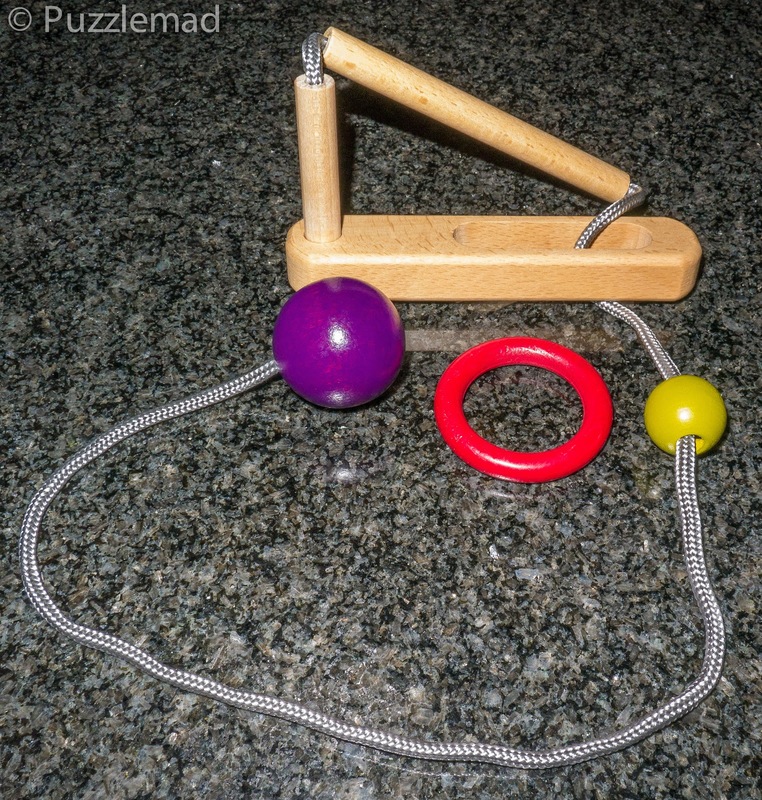 This puzzle is presented in a plastic tube rather than a box and when removed from the packaging, the huge length of string complete with balls, a ring and a jointed wooden board and dowels is revealed. 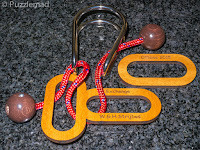 The puzzle is quite large at 14 x 7 x 5.5cm and is very well made - the string is very high quality and there is no way it will break without the use of considerable force. 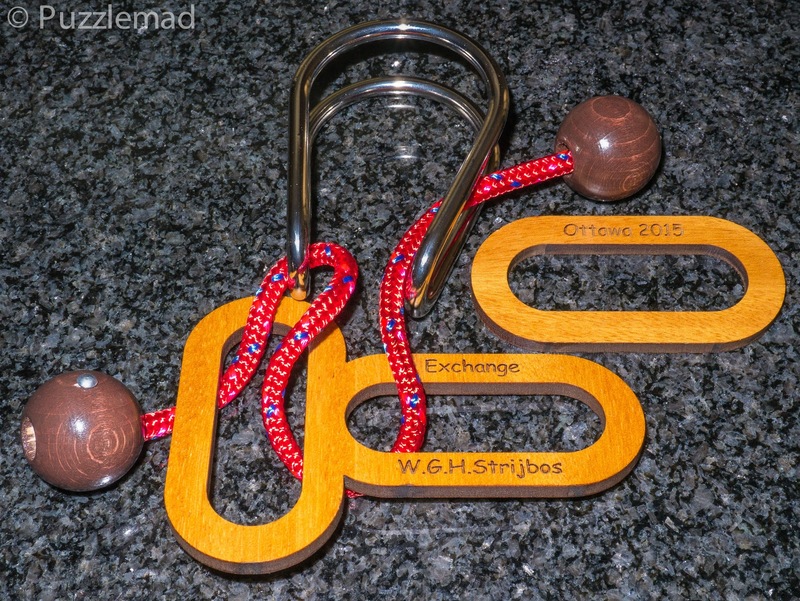 This is good and yet also bad - these string puzzles have a tendency to end up in an almighty knot and the ability to detach the string from it does allow for a quick reset if you end up in a mess (for example Wil Strijbos' exchange puzzle can be taken apart with the use of a pin. So be careful with the Max Out puzzle - whatever you do, make sure you can reverse your steps! So having presented this as a very tough puzzle (Puzzle Master have rated it as a 10/10 in difficulty too) and mentioned the need for a quickie, why is my title saying "It's not so hard"? The secret to this puzzle is that it bears a great resemblance to a classic type of disentanglement which most of you will have encountered during your puzzle journeys. Having taken the puzzle out and had a fiddle for a while - I realised it had a huge possibility for getting badly knotted up. At this point I sat and looked at it for a while. I had an inkling that I had seen something similar before - not the same puzzle but a familiar configuration. It was time for me to take a leaf out of Allard's book and think©. Much puzzling is based on experience - we learn from previous puzzles solved and rack up a catalogue of techniques which we can apply to new toys. My utter delight in the twisty puzzle genre is based on about 6 months of learning basic skills and then using those skills on new puzzles that come out - the key is to look, recognise similarities and think©. This particular puzzle is probably not a good idea for a beginner but if you are at all familiar with disentanglement puzzles then you WILL have come across this mechanism before - it is just a matter of recognising it. Hence the blog post title - Look and Think. Solved - did it in my head first! 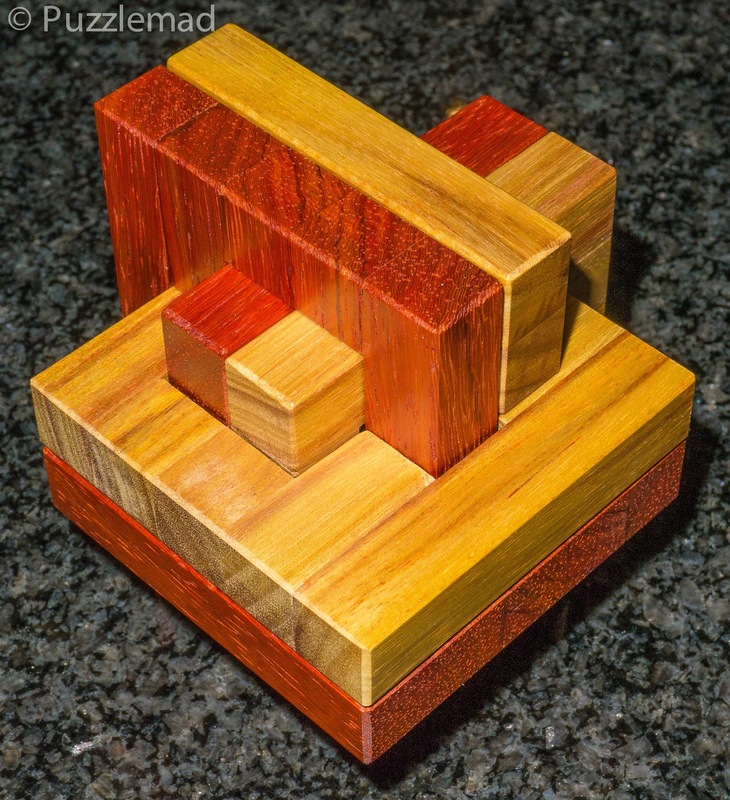 The Max Out puzzle can be ordered from Sloyd for a meagre €12.50 and is well worth a try - whilst you are there it's worth buying a few more - you can never have too many puzzles can you? Whack! Ouch! Sorry dear! I guess if you live in Canada then the postage will be cheaper from Puzzle Master. 6 boards - all apart after looking and thinking! Reassembly was relatively easy until I scrambled the boards - they all look too alike for me to do it now. I'm off to Burrtools for a happy ½ hour to get myself a solution file later. Solving puzzles can be trial and error but if that was all there was to it then they would not be as much fun as we all claim. The whole point is that we use knowledge, experience and skill to work them out and taking a minute to look and think is crucial. A similar experience with another unique burr did happen to me with the Maze-N-Cubes puzzle that was given to me by my friend Derek. This delightful little burr looks terribly complex but enough is visible that you can see inside and plan a pathway - hence the maze in the name. See! It's easy! Just Look, Think and Solve! Now back to the soup before Mrs S catches me! Whack! Ouch! Aargh - too late! I need to try some of that soup! Maybe it will help me solve a few more puzzles? It sounds delicious, at any rate! You're welcome to visit any time and have some soup - I very much doubt that it will improve puzzling skills! Probably not a good idea to post it! When you arrive please bring a cocktail or two?